…this is the time of year that everyone’s love affair with spices catch up with my year-round favorite flavors. I love all the warm spices that make the rounds every Autumn. Pumpkin spices in my coffee? Thanks a latte! Cinnamon spiced cereals? Yes, please. Throw it all into my grocery cart. May I have one of everything? I bought the Trader Joe’s jar of Pumpkin Butter… always wanted to do something with this stuff. 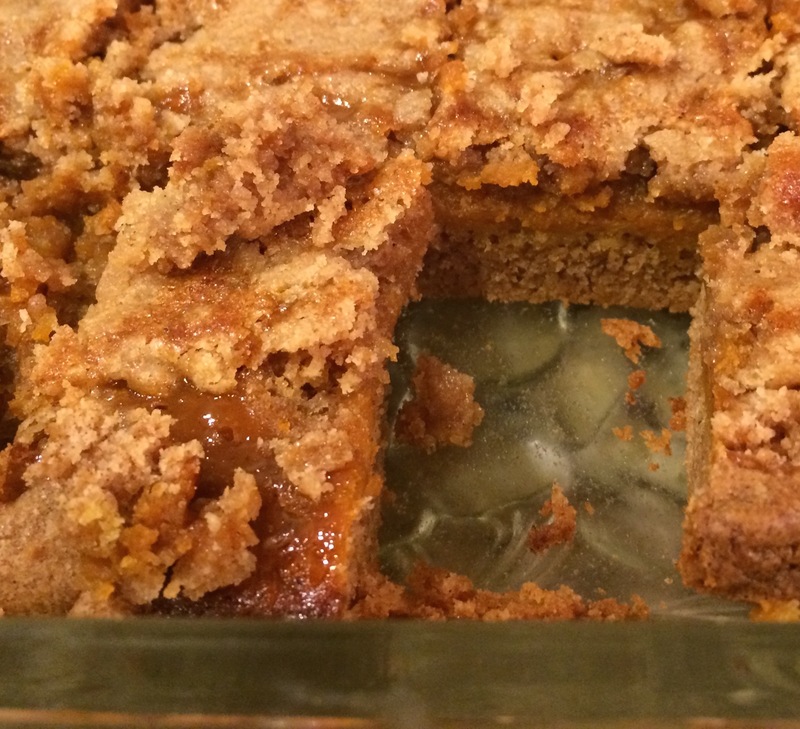 A little web searching came up with a blog that crossed the Williams Sonoma “Ooey Gooey Pumpkin Bars” with the Trader Joe’s ingredient at 1/6th the price. And The Husband Sayeth: “It is good.” Good, my foot, these bars are GREAT. 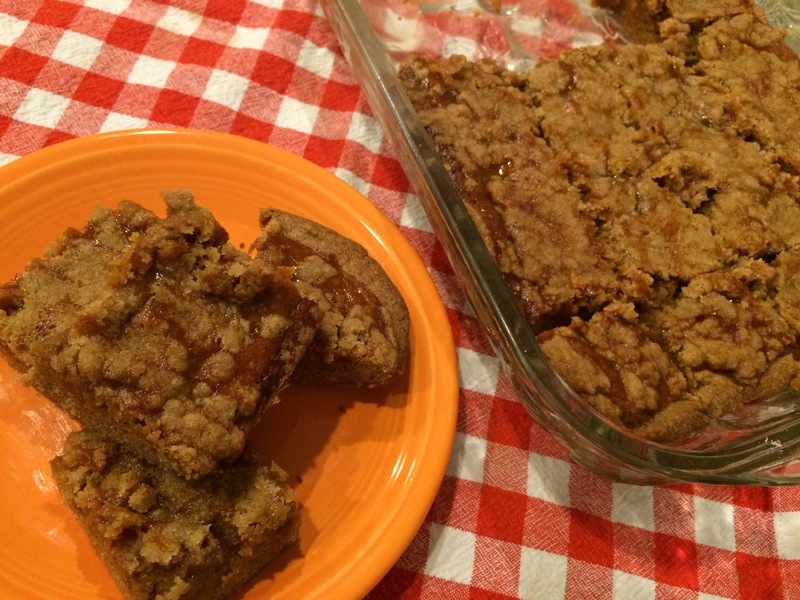 Thank you Sheila at SweetBakedLife.com for your Pumpkin Butter Dessert Bars– a delicious dessert that is too good to be served only one season of the year. Sheila made a few changes to the original recipe to the ever popular Williams Sonoma dessert so the proportions work with the slightly smaller jar of pumpkin butter from Trader Joe’s. Thanks for doing the work, Sheila, your recipe is dee-lish! I followed her recipe nearly exactly, substituting a spice cake mix for the standard yellow butter cake. I also omitted the cinnamon in the topping… good call. The cake mix could stand on its own spices. 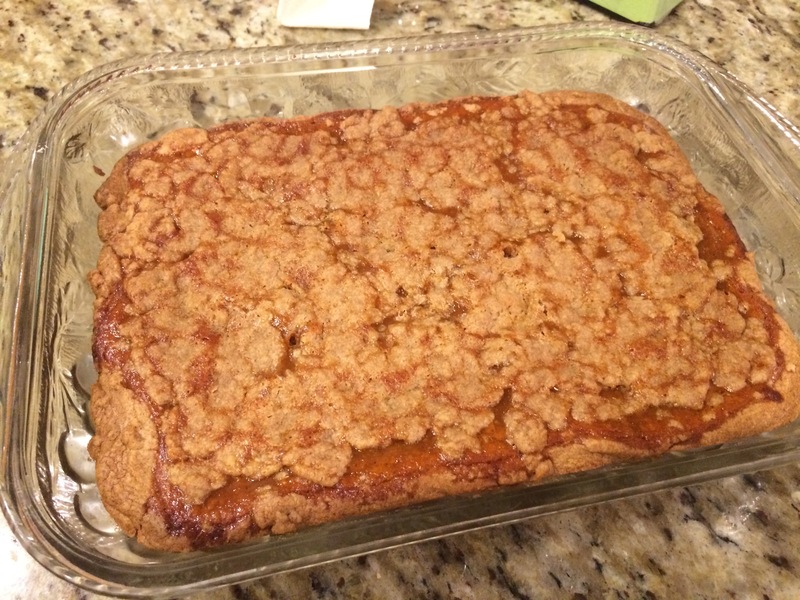 The bars took less than 20 minutes to mix, layer up, top off with crumbles, then only 45 minutes to bake. Served warm topped with ice cream or eaten out of hand, these are going to be in my regular rotation- any season, any occasion, any time. 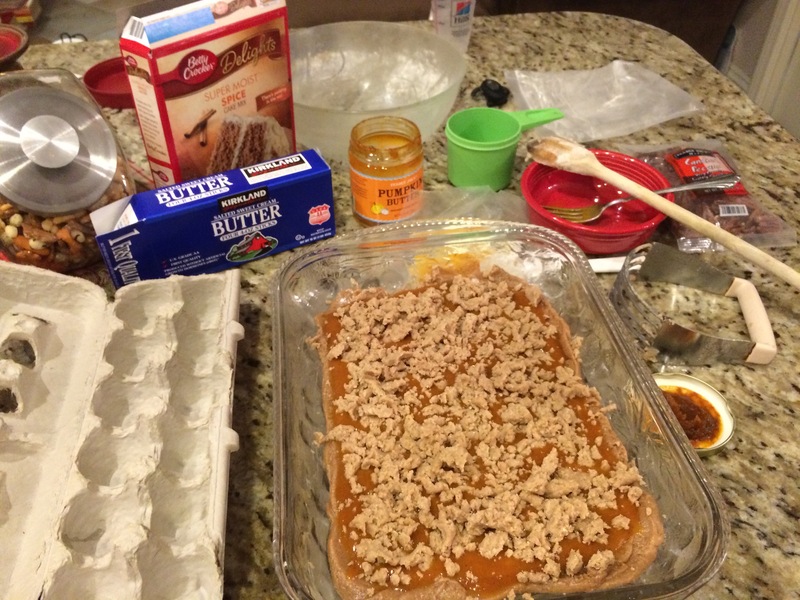 Pumpkin Butter, $2.29, cake mix $1.25, 3 eggs, a stick and a half of butter and little more… delicious.